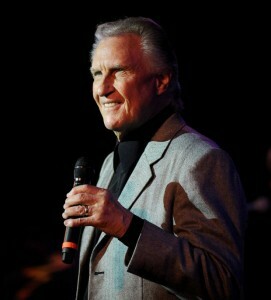 I thank Bill Medley after finishing the last page of his memoir. For letting me gain a little more self-confidence, ambition and determination. For sharing his lifelong experience with simplicity and sincerity. For being genuinely kind by writing in his preface:“Thanks for investing a piece of your life in learning about mine”. No, I thank you! He starts his story as a withdrawn and lonely boy, later becoming a teenager who went to the hairdressing school, but didn’t finish it… and ends it as an optimistic septuagenarian living every day with love – love for music, for fans, for his wife and kids and for all his friends, celebrities or not. This fascinating book is filled with stories, legendary ones, small ones or touching ones. My favourite legendary story is the one about naming the band: “In those days if you really liked something, a white guy would have said, “Boy, that’s cool” or “bitchin'”, but a black guy would have said, “That’s righteous!”. And if they liked you as a friend they’d call you a “brother” (…). Sometimes at the end of our songs they’d yell out: “That’s righteous, brother!”. 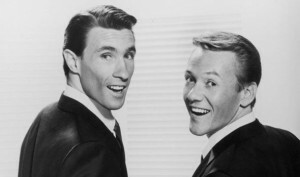 And that is how, inspired by the black Marines from El Toro Marine base, the Righteous Brothers got their name. promoted on black radio stations. The record label never mentioned they were white and, when they showed up to do interviews, the radio men were stunned. They’d still do the interview, but when they left, they’d quit playing their record. “Of course when “Lovin’ Feelin'” came around, they said, “Screw it, these guys are black. They’re black enough.” One DJ in Philadelphia started saying, “Here’s my blue-eyed soul brothers““, as in the ’50s and ’60s the term “blue-eye” was referring to a white guy. 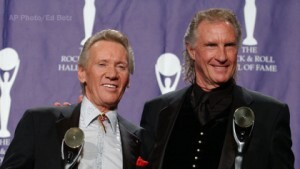 Elvis Presley was another famous friend of Bill Medley, after being introduced in his circle of trust. Funnily enough, when they played in Shindig show, Elvis was watching. Elvis himself was “a Righteous Brothers fan and friend” and made requests for the boys to perform certain songs. Bobby Darrin, Sammy Davis Jr., The Rolling Stones or Kenny Rogers were other great friends of the artist. And Sinatra liked him and offered him tips of how to preserve his voice in the dry climate of Las Vegas. Bill Medley was also the guilty pleasure of gorgeous women like Darlene Love, Mary Wilson (Th e Supremes) or Connie Stevens, but he finally found the love of his life, Paula. 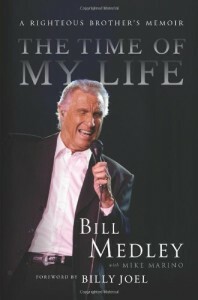 Read Bill Medley’s memoir for simple warm words, genuine fun, strong emotions and moving memories. You should not miss captivating stories like the creation of hits such as “You’ve Lost That Lovin’ Feelin’”, “(You’re My) Soul and Inspiration”, “Unchained Melody” or “(I’ve Had) The Time of My Life”, the surprising encounters with Kim Basinger or Whoopi Goldberg or the amusing reasons why Bill brought bad luck to Sylvester Stallone. Bill Medley is such a character, constantly rediscovering himself, so it’s worth discovering his memoir!